Heronfield is now closed and unable to offer accommodation to B&B enquiries. We apologise for any inconvenience this may cause those looking at this website for accommodation. "Heronfield" is indeed a 'house on a hill'. 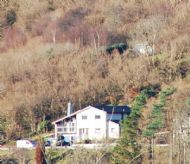 Set up above and overlooking Loch Portree with almost two acres of wild hillside garden containing many deciduous native woodland trees and shrubs.